SEPTEMBER 20 - 26, 2017 UCW 51 WWW.UPANDCOMINGWEEKLY.COM Best Urgent Care Next Care Urgent Care 217 Glensford Dr. (910) 483-4647 or www.nextcare.com You're having a great day. The sun is shining and all is well in the world — until it happens. Someone you care about has an accident in one way or another and needs medical attention quickly. No one can plan for these situations, except to know the shortest route to Next Care Urgent Care. Next Care is ready to help during life's most traumatic times. The urgent care facility has been an asset to Fayetteville families for 10 years. With a vision to be the leader in urgent care medicine, the doctors and staff are serious about your health and care for you until you've rounded the corner on a full recovery. That's why it has extended hours and why walk-in patients are welcome. "We strive to provide the best in both medical care and customer service," a staff representative said. 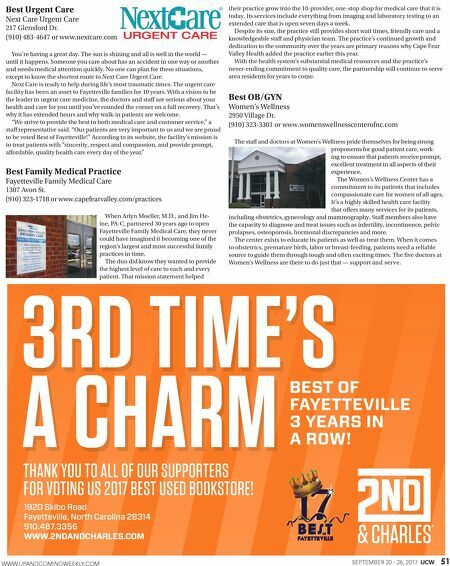 "Our patients are very important to us and we are proud to be voted Best of Fayetteville!" According to its website, the facility's mission is to treat patients with "sincerity, respect and compassion, and provide prompt, affordable, quality health care every day of the year." Best Family Medical Practice Fayetteville Family Medical Care 1307 Avon St. (910) 323-1718 or www.capefearvalley.com/practices When Arlyn Moeller, M.D., and Jim He- ine, PA-C, partnered 30 years ago to open Fayetteville Family Medical Care, they never could have imagined it becoming one of the region's largest and most successful family practices in time. The duo did know they wanted to provide the highest level of care to each and every patient. That mission statement helped their practice grow into the 10-provider, one-stop shop for medical care that it is today. Its services include everything from imaging and laboratory testing to an extended care that is open seven days a week. Despite its size, the practice still provides short wait times, friendly care and a knowledgeable staff and physician team. 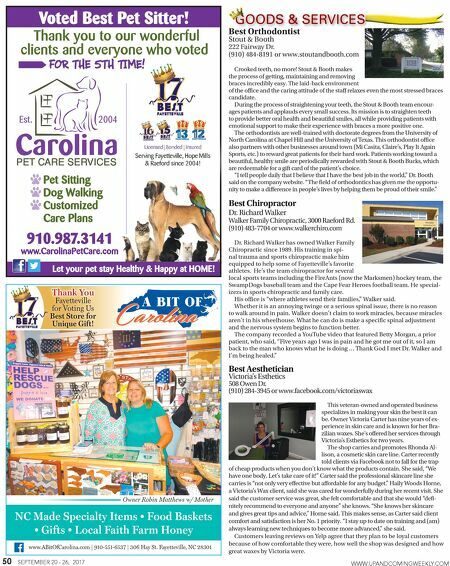 The practice's continued growth and dedication to the community over the years are primary reasons why Cape Fear Valley Health added the practice earlier this year. With the health system's substantial medical resources and the practice's never-ending commitment to quality care, the partnership will continue to serve area residents for years to come. Best OB/GYN Women's Wellness 2950 Village Dr. (910) 323-3301 or www.womenswellnesscenterofnc.com The staff and doctors at Women's Wellness pride themselves for being strong proponents for good patient care, work- ing to ensure that patients receive prompt, excellent treatment in all aspects of their experience. The Women's Wellness Center has a commitment to its patients that includes compassionate care for women of all ages. It's a highly skilled health care facility that offers many services for its patients, including obstetrics, gynecology and mammography. Staff members also have the capacity to diagnose and treat issues such as infertility, incontinence, pelvic prolapses, osteoporosis, hormonal discrepancies and more. The center exists to educate its patients as well as treat them. When it comes to obstetrics, premature birth, labor or breast-feeding, patients need a reliable source to guide them through tough and often exciting times. The five doctors at Women's Wellness are there to do just that — support and serve.